These delicious burritos are both healthy and quick to make. They're full of fresh ingredients like chicken, vegetables and whole grain rice. Chop a ½ cup each of tomato, jalepeno and onion to create a pico de gallo (coarse salsa). Place them in a small bowl and stir in a dash of salt, pepper and garlic powder. Refrigerate. Cook 6 servings of Minute Rice® Instant Whole Grain Brown Rice as directed. While rice is cooking, heat the beans and chopped chicken in the microwave. Once the rice is cooked, stir in 3 Tbsp of salsa. 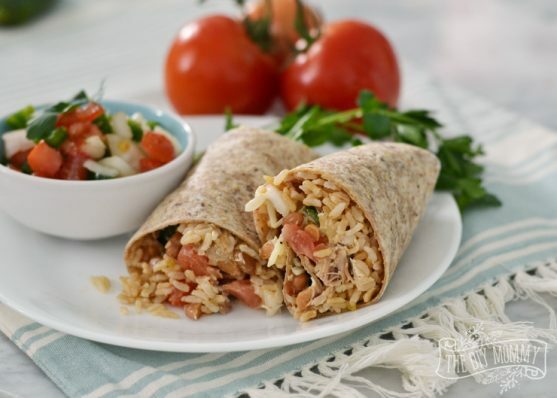 To assemble a burrito, place a ½ cup of rice in the center of a tortilla. Layer with some brown beans, chopped chicken, pico de gallo, cheese, aioli sauce, and chopped herbs if desired.